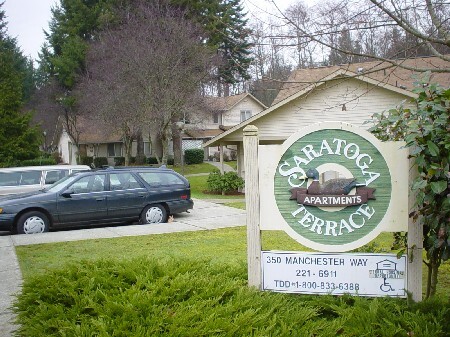 Saratoga Terrace Apartments operates by a Wait List per the eligibility standards of HUD, USDA - Rural Housing Services, by the Fair Housing laws and the policies of Quantum Management Services, Inc. There are 16 out of 24 apartment homes that have rental assistance where rent is based on 30% of your income and Section 8 is accepted. When you apply for residency, there is a minimum gross monthly income limit requirement of twice the value of the desired apartment home and a maximum gross income limit per the 'HERA' income limits; it is currently at 60% in Island County. There is also a Tenant Screening Policy through ORCA Information. It is currrently $40 per adult and $9 per person between the age of 12 yrs. to 17 yrs. Housing for individuals and families. We have affordable two and three bedroom apartments through the USDA Rental Assistance program and the Washington State Housing Finance Tax Credit program. Subsidy available for 16 out of 24 units at this property for qualified applicants. With this subsidy you will pay rent based on 30% of your income. A minimum of two persons must occupy the two bedroom units unless you have a Request for Reasonable Accommodation to justify the need for a single person going into a 2 bedroom apartment home. When there is no rental assistance at the time of move-in, base rent is expected. If subsidy is not available at move-in, your rent will not be subsidized. However. once a tenant, if qualified for subsidy, your household will be placed on a wait list for subsidy based on greatest need. We have two and three bedroom, single story and townhouse apartments. A minimum of two persons must occupy the two bedroom units, unless a Request for Reasonable Accommodation applies. Located in beautiful Langley, WA on Whidbey Island. Nice property for individuals and families. Lots of trees in a natural setting. On bus lines, across from Island County Fairgrounds and close to schools. There is a No Smoke Addendum. Income Limit Details: Very low to Moderate USDA income limits with preference for lower income limits. Also must qualify for Tax Credit income limits. We have affordable two and three bedroom apartments through the USDA Rental Assistance program and the Washington State Housing Finance Tax Credit program. A minimum of two persons must occupy the two bedroom units. Subsidy available for 16 out of 24 units at this property for qualified applicants. With this subsidy you will pay rent based on 30% of your income - between the lowest and the highest rent listed above. Call property for details. Base rent applies for non-subsidized units. There is currently no rental assistance at this time due to high occupancy and no rental assistance available to give. Rent will be Basic Rent and there is a minimum income requirement of 2x Basic Rent. There is also a maximum income requirement per the HERA Income Limits.